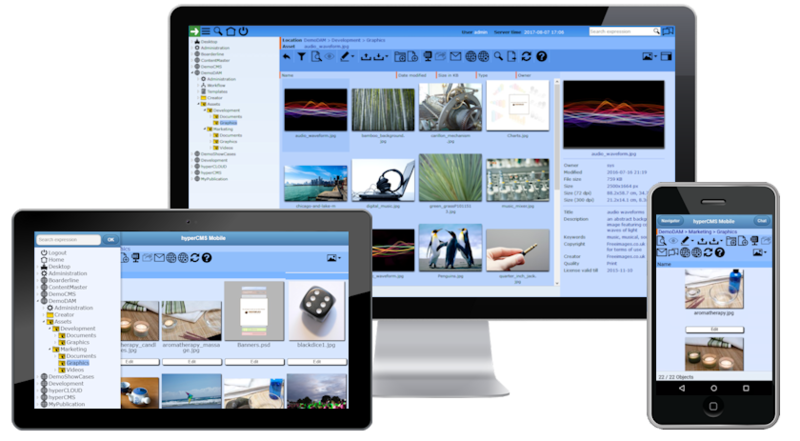 Digital Asset Management (DAM) offers an effective solution for enterprises and organisations to store, manage, find, retrieve, share, and distribute digital assets (files). Digital assets can be images, photos, creative files, video, audio, presentations, documents and more. The asset is detailed by its metadata. Metadata is the description of the asset and the description depth can vary depending on the needs of the system, designer, or user. 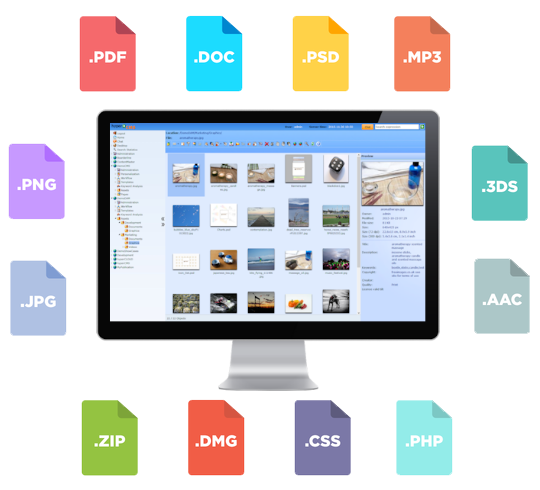 The term "Digital Asset Management" covers a large area of software solutions, from a simple digital file library or a photographer’s photo database to more complex solutions that cover enterprise content management. A good digital asset management software has core capabilities surrounding mass storage, how assets are retrieved, how assets are shared/used and features for brand management. DAM enables creative workflow automation, security/encryption of your assets, license tracking, usage tracking, asset publishing and more. A DAM solution should be quick to deploy and easy-to-use, whether it is cloud based or on-premise. A DAM is your centralized digital library that provides employees, clients, contractors, and any other stakeholders with controlled access to your digital assets. Merchandiser can advance brand growth and boost brand consistency across all branded content. By using the system, you are able to create marketing materials with dynamic templates which can be easily distributed to all of the marketing office around the world. Distributors and partners can modify your materials according to their local language and regulations. Many companies utilize DAM to optimize creative workflows for their designers and creatives. Being able to search and find files in seconds and also reuse existing assets saves valuable time. Agencies uses DAM to accommodate a professional experience clients like to see. A branded web portal keeps creative files organized while matching your brand, ensuring a consistent corporate design when clients and users access it. By having the latest marketing materials, distributors accomplish success, enhance brand consistency, and optimize the delivery process across your network. Furthermore, sales teams can regularly have the most up-to-date materials they need, anywhere, anytime, from any device. DAM supplies and coordinates marketing materials for your sales teams to amplify brand consistency. Additionaly, IT departments feel guarded with cloud DAM and don't need to worry about running a sofisticated infrastructure. DAM eliminates unsecure FTP servers, third-party file exchange solutions and increases security of your digital assets. 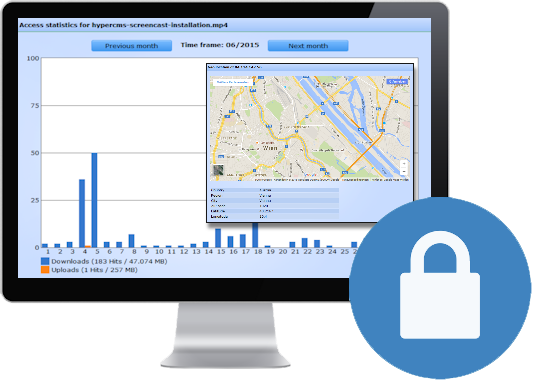 A DAM software provides access to all of your digital media, anytime, anywhere. Businesses must be mobile these days. Have secured access to all of your business critical files from any device whether you’re at your desk, working from home or from your mobile device around the world. A DAM solution provides exactly what you need to easily manage, access, share, and track all of your digital assets. Increase efficiency by locating the exact file instantly. Find files fast based off of specific metadata captured in the file. Reuse existing assets instead of recreating it. Keep track of your files history and be informed on the usage and viewing of your digital assets. Protect assets using watermarks on images and videos to ensure they can't be easily reused without your permission. Embed copyright or contact information into every image or file so external parties can contact the right person. Automate workflows, streamline content creation, and distribution processes. Control when press kits, photos, and critical documents are distributed and viewed. Increase efficiency by integrating a DAM with other enterprise software. Pull files directly from a DAM while working in Adobe Indesign, MS Office, Open Office and more. Keep files securely maintained in the DAM while collaborating with internal and external teams. Manage edits, make annotations, and submit approvals in your digital asset management. Reduce production delays and costs by assigning tasks to internal and external teams.